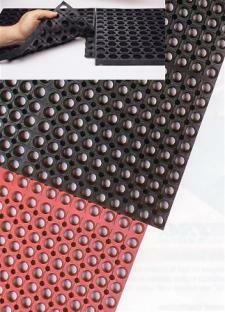 Anti-fatigue mats can help with traction. Slipping and falling at work is a common injury for many employees, but with the right safety precautions it can be avoided. Anti-fatigue mats are a great way to add traction to heavily trafficked areas, which can typically be a little more slippery due to the general wear to the floor and chances for spills. According to Alamosa News, falling is an unfortunate risk in any profession, since everyone is exposed to tripping hazards no matter what sector they work in. The news source suggests communication and awareness are two of the biggest ways to make an impact in reducing falls. If more workers are aware of where they’re walking and alert as they travel, they can note any tripping hazards in their path. Additionally, the news provider suggests keeping the floor, stairs and doorways clear of any hazards can help reduce the chances of tripping. Don’t just focus on the floor itself, also keep visibility in mind. Grainger reports adding the right lighting so people can clearly see their path can help. This can also highlight if there is any moisture on the ground that may have been hidden due to poor lighting. This way, more people can see it and can put a slipping awareness sign up until the spill is cleaned.